I tried my luck at the beach over the weekend. I found a ton of fiddler crabs plundering what they could before the tide came in. There was bait every where but I only managed to catch one small Jack Crevalle. Not the greatest video but it does give you a little moment of Zen. Many people ask me what the mountains of North Carolina look like. This video does a good job of showing the beauty of our mountains and forests. I have been eyeing GoPro cameras for quite awhile. I just couldn't justify paying $300. I searched Amazon for a waterproof camera and stumbled upon the GeekPro. At first glance I thought maybe someone posted the wrong info. 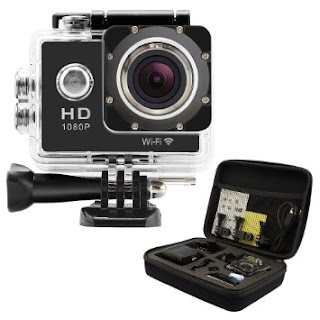 The camera looks exactly like a GoPro but it's under $70. After reading the description I became even more interested. The specs were almost exactly like a GoPro3. I figured this camera is still probably crap but all of the reviews gave it 5 stars and included video footage. I decided for that price it was worth trying. The camera comes with a water proof case and a bunch of different mounts. Any GoPro accessory will also fit this camera. I was really excited to see how this camera took underwater photos so I decided to try it while fishing recently. I'm pretty happy with the results. I took the camera out on the kayak Saturday. I tried mounting it with a pole in one of the rod holders. It's a work in progress but I think the quality is pretty good. The camera can record at 1080p at 30fpt, I record mostly all the video at 720fps. It uses less battery and runs at 60fps. The only drawback to the camera is the case. I think when the sun shines on the case it causes a yellow tint to form at times. One really cool feature of the camera is the WiFi function. You can use your cell phone as a remote and see what the camera is seeing from your phone. You can also start and stop recording from your phone. I'll be using this camera quite a bit and I'll try to share more videos. 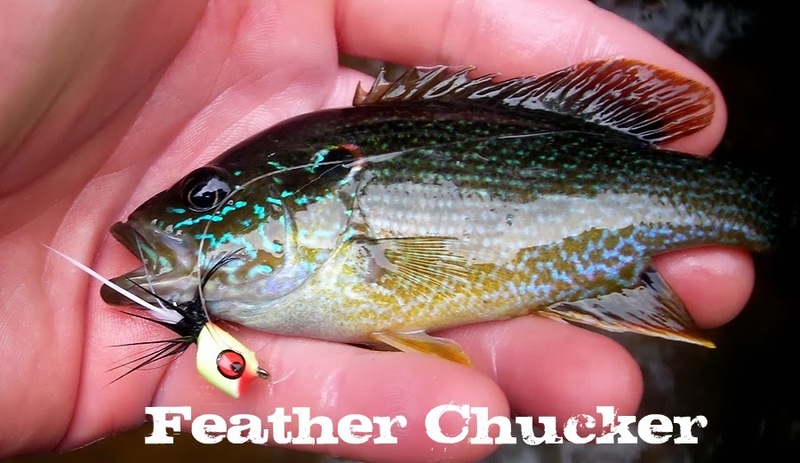 Frankenfly is doing something similar to what The Fiberglass Manifesto did last year with "TheYearOfTheBluegill." The new thing is called the BucketMouthLeague. I'm usually not into stuff like this but I have to admit the logo FrankenFly is having made up looks awesome. I'd really like to get it for my kayak. First things first though. I need to start catching some largemouths. The hot weather lately has turned me off to fishing. Today was the first day we had that wasn't above 90 and super humid. It was just 90 and dry. I tried to make the most of the last few hours of daylight. There was a pond I hadn't fished much but it has always been decent each time I've visited. The first 30min was dead. I didn't have so much as a sniff on my fly. 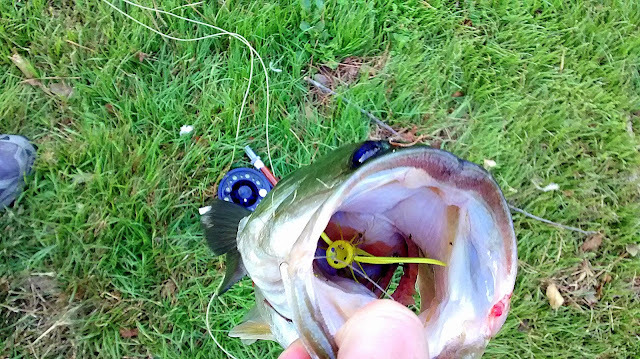 I really wanted to catch something on top water so I stuck with a popper. I could see minnows all over near the bank. There were so many the water quivered. I tried every retrieve I could think of but nothing seemed to elicit a strike. I came to a cement intake and decided to try something different. I cast near the structure and my fly landed on top of it. I pulled it off and the fly landed next to the intake. I started to jerk the fly with violent strips. I wanted the action to look really abnormal. Nothing like anything you'd see in nature. After my 5th strip the fly was gone and a green flash shimmered along the surface then disappeared into the dark water. It happened so fast by the time I set the hook the fish basically hooked itself. I could tell from the bend in the rod the fish was good size. Then it shot out of the water and shook its head. I gave the rod a few more good yanks to ensure the hook set was good. When I landed the fish I was wondering where the heck my fly went. I never get used to bass flies. Every time I use them I always think they are too large. 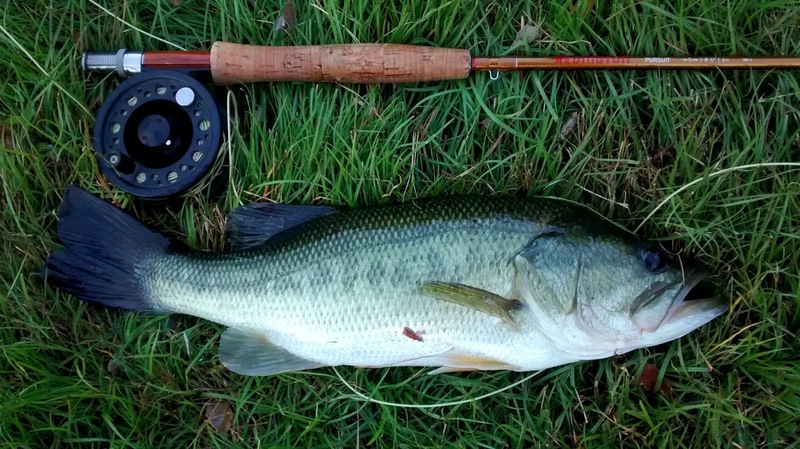 This fly is a size 4 and you can see there is room to spare in this bass's mouth. The fish was very healthy and strong. It swam away with ease after I released it. A few casts later I had another fish on. My retrieve seemed to make all the difference in the world. I had to really pop the fly and make a major disturbance to get any attention from the fish. It's the first time I've ever had that happen. A learning experience for sure. It was a great evening and I got my first fish for the Bucket Mouth League.